When state Sen. Rob Wagner and state Rep. Andrea Salinas proposed Senate Bill 501, they expected some resistance. But they did not expect death threats. SB 501 was drafted using input from a group of high schoolers known as Students for Change in an effort to curb gun violence and increase safety across the state. The comprehensive legislation calls for changes to how guns are purchased and stored, magazine size, ammunition limits and more. Members of Students for Change say the bill is neither unreasonable nor unrealistic. There are currently 14 bills submitted to the Oregon Legislature regarding gun reform, they say; SB 501 simply calls for the widest range of changes. But the bill's introduction earlier this month has prompted a deluge of angry emails and a rally against its components at the Capitol in Salem. Oregon State Police troopers are also investigating threats made against Wagner and Salinas, although no details about those threats have been released. Regardless, Penelope Spurr — a Lake Oswego High School student and one of the original members of Students for Change — says that despite the opposition to the bill, she and other students are not deterred. "We did not see it coming, receiving the amount of hate that's been coming in," she said. "We've got to fight back against that. None of the comments have really affected us too much, because it's a lot easier to say negative things behind a computer. In person, the response has been very supportive." Spurr, who is also an appointed student member of the Lake Oswego School Board, says that in the wake of the shooting in Parkland, Fla., and other incidents of on-campus violence across the country, members of Students for Change decided something had to be done. "We felt so unsafe and we decided to take it upon ourselves and do something," she said. "But when your opposition is the group that carries around AR-15s, it can be scary psychologically." 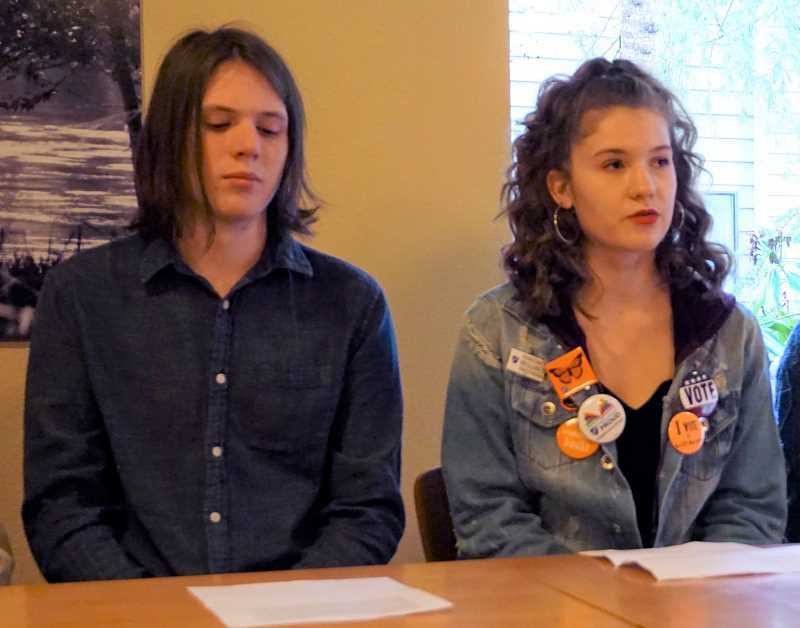 Spurr and other members of Students for Change joined Wagner and Salinas for a news conference Sunday in Lake Oswego to talk about the bill. A Lake Oswego police officer, who arrived in an unmarked car, was also in attendance. 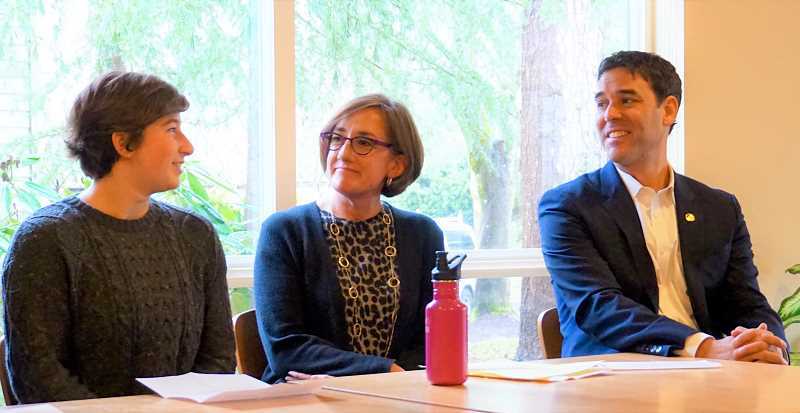 "These students know what it actually feels like to know that the threat of gun violence is outside of their classroom door at all times," said Salinas, a Lake Oswego Democrat who was appointed to the Legislature last year and ran unopposed for a full term in November. "I'm not here to debate the issue of gun control. I'm here to support these students. They want to engage in constructive dialogue, which is their right." Salinas said she hasn't been discouraged by negative responses, but doesn't find them particularly helpful, either. "I didn't take this position to shy away from criticism. This is what democracy is about," she said. "I appreciate comments, because I can learn from them. But I don't find it helpful to be attacked. This could be a useful dialogue." Wagner, a Democrat who also was appointed to the Legislature last year and elected to his first full term in November, agreed with Salinas. "After Parkland, we saw hundreds of students from our district come to Salem looking for a voice in this process," he said. "These are our constituents who have a right to be part of this debate." Specifically, SB 501 would require Oregon residents to secure a permit before obtaining a gun, require guns to be secured in a specific way, require gun owners to report lost or stolen firearms, limit magazines to five rounds of ammunition, limit ammo purchases to 20 rounds per 30 days and add requirements for transferring ammo or guns between parties. On Sunday, student activists expressed concern that people with unfavorable views of the bill don't understand what it's like to attend school at a time of increased violence and divisiveness. Eliana Andrews, a Portland high schooler who helped organize the March for Our Lives Portland last spring, is now working with Students for Change. "We've had so many mass shootings that we now have to prepare for one in the future," she said. "I don't want to take people's Second Amendment rights, and I don't think this bill does that … but I believe in a future where an active-shooter situation is unimaginable." Wylie Thompson, a high school student from Salem, said he has experienced many lockdown drills, just like many current students in the United States. "In all of my classes, we have a certain plan for how we're going to barricade the door and which corner to hide in," Thompson said, "because some of the walls are concrete and some are just drywall." Lakeridge High School student Eli Counce, who founded Students for Change in the wake of the Parkland shooting, says now that the bill has been introduced, he feels one step closer to safety. "It feels like we're on the cusp of something big," he said. "This bill is really valuable. I don't think that what our bill is proposing is all that radical. It's really just sensible gun safety. It's common-sense stuff." Spurr said that some of the criticism is coming from people who don't have a full understanding of what SB 501 would do. "We highly suggest reading the bill," she said. "We did a lot of research into what other states have already implemented, so we really feel like what we are asking for is reasonable. Unfortunately, (in other states) those were done as reactionary measures after mass shootings had already happened." To members of Students for Change, gun safety should not be a partisan issue, but something everyone can support in order to save lives. "Shooters do not ask people if they are Democrats or Republicans, if they are gun owners or not," Spurr said. "They just pull the trigger." No hearings have been scheduled for SB 501, but Salinas said it will likely be debated — along with the other gun legislation that has been proposed — in the session of the Legislature that started this week. Members of Students for Change are hoping that they'll be allowed to testify. "We don't just want to propose the bill and sit back and let it go," said Spurr, "We want to do more." Counce said it's important that legislators hear students' voices when considering the proposal. "There was a time when students didn't have to think about this kind of legislation," he said. "We want to remind them of the emotion that is behind this, and the passion that inspired it." An audience member at Sunday's news conference told the students that she is sorry her generation (baby boomers) didn't do more to help curb the issue of gun violence. "We as a generation have let you down, but it has given me so much hope to see your actions," she said. "You're leading us. You're saving us. I feel so bad that we have let you down, and I am so thankful that you are here to show us how a democracy should be." To read the full text of Senate Bill 501, go to tinyurl.com/SB501.